Hanging from the eaves of my front porch is a fuschia basket that my husband carefully pruned and wrapped up last fall in hopes of protecting it from the harsh elements of winter. Sure enough, it’s now bursting forth with lush green foliage and lots of buds promising to bloom. And right smack dab in the center is a sweet little nest, with four tiny eggs, and one hyper-vigilant mama Chickadee. A few years ago, another mama bird did the same thing. At that time, I was recovering from yet another back surgery and just beginning to venture out into the world after several months at home. It had been a grueling and brutal ordeal, I was beat down and exhausted , and the front porch was as far as I could get. Literally. My husband had moved a chair onto the porch that I could get in and out of by myself. A few moments of fresh air, sunshine, and a glimpse of my garden in spring were dangled as a carrot – something to lure me out of the darkness and encourage me to crawl out of bed and put one foot in front of the other. Aim for once a day, said The Nice Catholic Boy. Baby steps. You can do it, Baby! As I write this five years later, even though I am recovered and upright and mobile, even though I’m completely free of opiates and methadone and mind-numbing painkillers, even though I’m able to work with reasonable limitations and lead a full and meaningful life, and even though I’m grateful, TRULY grateful … recalling that period of my life and my overwhelming sense of despair is especially painful and brings tears to my eyes. I often joke with my neurosurgeon and tell her she should name a surgical wing after me – I’ve been there so many times that I’m sure I’ve paid for it. And I swear I’m going to get a tattoo across my low back that says “Still Standing” … someday. But it really isn’t all that funny, and where I’ve been to get to where I’m at now – I don’t want to revisit it. But then I saw the Chickadee and I recalled the mama bird who quietly kept me company while she nested. Unlike the frantic little mother currently in residence, this one didn’t panic when she saw me coming. I watched her as she gathered little twigs and mud and built her nest. Not long after, she laid two speckled eggs. And then she waited. I’ll sit here, and you can sit there, she seemed to say to me. We’ll wait it out together. 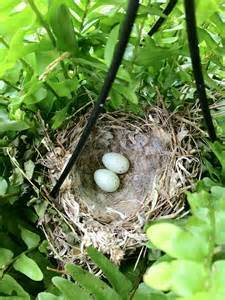 In time, I found myself looking forward to my front porch visits with Hannah (yep, I named her), anticipating the day when her eggs would hatch and I would get to meet her little brood. But Mother Nature was taking her time. I began to find things to worry about – like that Hannah would be killed by feral cats and her eggs would be orphaned, and I fretted that the raccoons would find her nest. But there was absolutely nothing that I could do to intervene. I knew it. It was out of my hands. Hannah was steady and true. She’d fly out of the nest periodically to find a worm, and then return to resume the wait. I marveled at her patience and ability to quietly endure, and wished I could do the same. Patience, however, was not one of my particular virtues. At some point in the process, I came upon the words of Luc de Clapiers, a French writer who died at the age of 31 in the late 1700s, in broken health. “Patience” he wrote, “is the art of hoping.” And I realized that in the midst of what was one of my greatest personal challenges, I was being given the opportunity to become more than who I was, and to learn the fine art of hoping. It was more than just hoping for the successful hatching of baby birds; I began to hope for me. In time, a crack appeared in one of the eggs, and soon a little beak, followed by a scraggly creature that looked NOTHING like its graceful mother. And then another. A day later, little tiny chirps could be heard from my hanging basket! As they grew, they were emboldened to perch on the edge of the nest and flap their little wings. And then one day they were gone – all of them! Hannah had launched her kids and moved on. Ironically, it was about this time that I began to walk without a cane, first past the end of the cul-de-sac and then around the corner and beyond. I was beginning to taper off the multitude of medications that had previously kept life bearable, my head was thinking more clearly, and I was able to make short trips into my shop and feel a part of something again. As I slowly became a more active participant in life, I found that my view of my little corner of the universe had changed. I’m of the belief that perception is reality, and all those hours on the porch waiting for two eggs to hatch had caused a paradigm shift in how I viewed the world and my place in it. I no longer had the energy or the inclination to “sweat the small stuff.” I found myself patiently waiting for situations to work themselves out without my intervention or “help”. I consciously started my days taking a grateful inventory of my blessings instead of lamenting my losses. And I came to believe that if, indeed, the creator of the universe has His eye on the sparrow, then He most certainly is watching over me. All this flooded back to me last week as I discovered the Chickadee and her little secret. I wish I could quell her anxiety every time I walk by instead of sending her into a panic. She has an important task ahead of her and I don’t want her fear of me to be a distraction. She doesn’t speak English and I don’t speak Bird, and there’s no way I can alter her perspective of me or the world around her. So for the next few weeks, or as long as it takes, Gene and I will come and go through the back door in the hopes of keeping the disruption to her little life at a minimum. It’s the least we can do. And what a delightful thing I’ve discovered … on a clear night, the view of the moon from our back porch is spectacular! If not for the Chickadee, I wouldn’t have known. Pingback: A little bird told me … | Fork It Over! Cindy, your story is wonderful. It came to my email at just the right time. Thank you.